Webinar to feature leaders from Clark University discussing how they use data and predictive analytics for and student engagement efforts. Conway, NH – Rapid Insight Inc., a leading provider of easy to use predictive analytics and data blending software for higher education, announced today that it will sponsor a live webinar hosted by University Business, featuring Clark University. The webinar will take place on March 29th, from 2:00 PM to 3:00 PM Eastern time, and will be given by Tristan Deveney, Associate Director of Admissions, at Clark. After an 87 percent increase in application volume over a five-year period, Clark University knew they needed to overhaul their yield forecasting and admitted student engagement efforts. They made the decision to bring their predictive analytics efforts in-house to achieve these goals. As a result, they have been able to give their staff timelier, actionable insights and personalize their student outreach efforts. 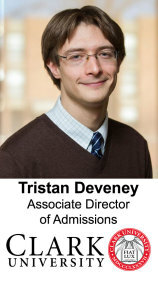 “Bringing predictive modeling in house has improved our forecasting ability and given us the tools we needed to reevaluate our yield efforts by helping us better understand where the actions of our admissions staff can make the most difference,” said Tristan Deveney, Clark’s Associate Director of Admissions.